Anti-reflection coatings minimize reflections from glass surfaces. To offer excellent anti-reflection properties and high optical light transmission in the visible wavelength range, we have developed our ARC coating series. The ARC series are based on vacuum-coated, multi-layer dielectric thin-film coatings whose layers adapt the refractive index of the substrate to the refractive index of the ambient air. An uncoated glass shows a typical reflection of 8,5% in the visible spectrum. Our ARC coating layers are able to reduce these reflections in parts of this spectral range to below 0,2% per surface. Compared to a simple single-layer anti-reflection coating design, which typically reflects about 1-2% of the incident light per surface, this is a noticeable improvement that can be clearly seen with the naked eye. In addition to the properties already described, our ARC anti-reflection coatings effectively suppress unwanted secondary reflections. Such effects occur with uncoated glass and cause a transmitted image to be superimposed and thus appear blurred. By using our ARC coating, the image remains sharper, brighter, offers significantly better contrast and the image quality is maintained. When used as a laser window, double laser beams are suppressed by our ARC layers and the available laser power increases, since almost no light is reflected and is therefore available in transmission. The layers of our double-sided coated ARC and single-sided coated ARC-1S materials are applied in a vacuum deposition process to a high-quality selected, iron-reduced float glass. For the ARC-B series we use BOROFLOAT® substrates. We adapt the refractive index of the anti-reflection coatings to the respective glass-air transition. Both ARC coating series are usually always available from stock, as we manufacture them regularly. We are not limited to the anti-reflection coatings described above. On request, we also coat other substrate materials and finished optics and we can adapt the refractive index of the anti-reflection coatings to the respective carrier glass. We can also coat optical lenses and other optics provided by the customer with our anti-reflection coatings on a batch basis. On request, optical anti-reflection coatings for other wavelengths are also available according to customer requirements. How do I get a quotation? Are there fixed dimensions? You are free to specify the dimensions! Our company specializes in the rapid production and delivery of optics with individual size. We quote, manufacture, and deliver custom sized optics as fast as usually fixed dimensions can be shipped. 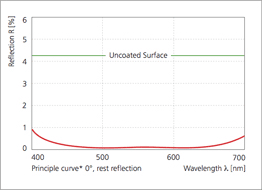 Reflection curve of the ARC multi-layer coating compared to a surface without coating in the visible wavelength area. In case you want to get a batch of optical lenses anti-reflection coated, please let us know the exact specifications of the lenses you are supplying. It is essential to specify the refraction index of the lens material as well as the exact lens dimensions and focal length. The lenses to be coated must not already have a coating layer. Please specify the maximum allowed amount of light that still might be reflected (residual reflection) by the lens surface, the relevant wavelength area, and the light source used. All given details and specifications are mean reference values and are not guaranteed. Also, please consider our "Notes on specifications".